Fear is one of the biggest hindrance on the journey of soul evolution. It has hold humanity in survival mode with control and manipulation. However, fear is, in fact, nothing more but an illusion of the mind and emotion. Once we understand its nature and function, and face it squally, it immediately ceases to be and have no power to control over us anymore. This affirmation is designed to assist you to face whatever fear you have, deal with them one by one. Once we start to face it, we will be able to transform whatever we are afraid of into our greatest strength and gift. When we no longer have fear, we are able to manifest what we desire easily and freely, and we can create the most beautiful, abundant and happy reality for ourselves. 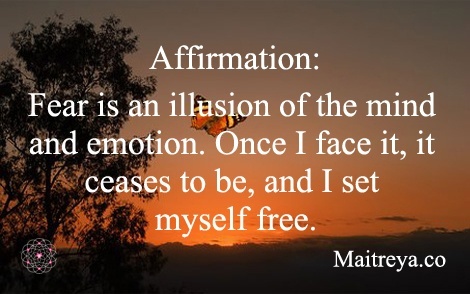 By saying the affirmation, you start to work on facing your fear one by one. By doing so, the energy around you begins to change positively, and all areas of your life will then reflect the positive change. You can repeat the affirmation as many times as you can. The more you say it, the more positive reality you can manifest in your life. We sincerely hope that you can benefit from this affirmation. Please feel free to give us feedback or share your experience with us. Thank you!